Those were the words my doctor said to me at my 37 week appointment. They did not let me leave the hospital because my blood pressure was high. I went straight down to labor and delivery to be admitted. I had to call The Mom and have her go to my house to pack my bag. Luckily I had made my list! I walked her through the house to get each item. I was admitted and they said they would start the pitocin at midnight. I did not write a specific birth plan down but I have to say that this was the one way I had hoped NOT to do. I really did not want to be induced because it takes so long but alas 12 a.m. on Thursday, August 30, 2012 I was induced. Sleep was impossible. My mind was going in every direction. Amazingly I was not nervous at all just antsy about the long wait and getting too tired. At 5 a.m., they arrived to break my water. I have to say that was the strangest part of the whole process. It is just weird, gross, icky, and eww! There is not much to tell of the next few hours except that I amazingly only had to feel 45 minutes of contractions thanks to modern medicine! I dilated fairly quickly, but I did take a dose of Nubain before my epidural. I have never done recreational drugs but I think that the Nubain was the closest experience I have ever had to them! It was psychedelic! The epidural was nothing! I did not feel a thing, though I was shuddering constantly as a side effect of the Nubain. The funniest part was my left leg swelled up so big but my right leg stayed normal so I had this cartoon look to my body. The Mom would pat my left leg and it was the oddest thing because I knew I should be able to feel it, and my brain could see it, but there was no feeling in that leg! Then finally around 1:30ish, it came time for action. She was "sunny side up" as they call it, so I did a lot of useless pushing before they were able to turn her. I did not think she was ever going to come out of me! I kept praying "God just get her out, please!" Even with the epidural dulling the pain, I do not think I have done anything that strenuous before in my entire life! I was not the calm, sweet, moaning woman we saw on the videos in the birthing class. Now proudly I can say I did not curse, yell, or scream angrily. However, I did throw up, cry, cough, shudder, fuss at the stupid blood pressure cuff, grunt, and gasp for air a lot! But at 3:18 p.m. on Thursday August 30, 2012, our life changed. 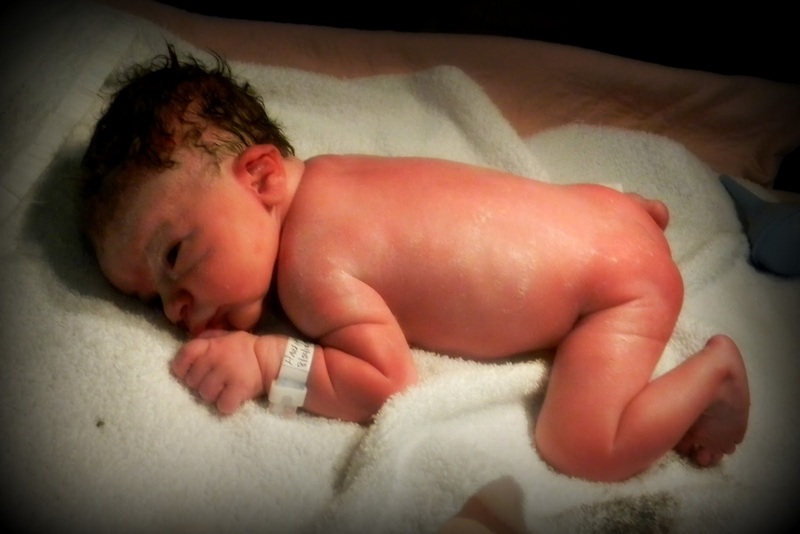 A head full of dark hair, 20 inches long and weighing 6lbs 5oz, "Bunny" (as we will now call her on this blog) was born! One of the funniest things was when they tried to place her on my chest, her umbilical cord was too short so they had to wait until E cut it before she could really be placed on my chest. It was love at first goo covered sight!